Before the light faded (does it seem like it's a wee bit lighter later to you?) we set out for a tramp around the Bog. When entering the path, there's a choice to make, left or right. We usually choose left so that we can dawdle towards the end of walk and watch the ducks. Our choice of left didn't take us very far. Above is the path flooded by all the heavy rain we've been having. So we turned around the other way, walked to about the mid point of the trail and back again, allowing us two chances to observe the bird life on the open water. It was a busy place, with mallards, American wigeons, Canada geese, and a coot or two. The sky was grey and overcast, but the rain held off until later in the evening. Rain and wind in the night were followed by hail in the morning, and very overcast skies on our drive to church. What a lovely surprise to see blue skies and bright sunshine when we came out. One little boy, about 2, said, "I should have worn my sunglasses." We decided to take advantage of the break in the weather and quickly changed and drove to Tod Inlet. Although the woods obscure most of the light, when the sun filtered through it rendered the forest a most magical place, full of sparkle and amazing detail, like the moss above. The creek feeding the inlet rushes along these days, collecting all sorts of muddy debris which it deposits into the inlet, turning the water distinctly green. Someone decorates a tree there every Christmas, and a few ornaments remained, along with strings of delectable seeds and pods for the birds to nibble on. "Beauty surrounds us" says Rumi, who continues on to say, "but usually we need to be walking in a garden to know it." Or perhaps the woods. After our walk, we went to the Seahorse Cafe on the water for lunch. I enjoyed a salad and warming French Onion Soup. Tim had a small bowl of Coconut Chicken Curry soup and a Mediterranean Chicken Wrap. Yum. As we sat in the bright light next to the window, we watched the clouds gather on the mountains, then drift downwards to the water and move across the inlet to drop fat raindrops and obscure the landscape. How pretty the boats, canoes, and other brightly painted bits and pieces looked in both sunshine and shadow. Lorrie - your photography is mesmerizing. You have such a talent for finding the light (as in the moss picture) or the dark (a perfect backdrop for the boat picture). Thanks for contributing your talent to Mosaic Monday - it is a joy for us all. Happy New Year! Happy and Healthy New Year! I took a mini blog break over Christmas and it feels good to be back now in a quieter month. I love your photos, as the first few remind me of the Salt Marsh where I walked frequently when I lived in NY. 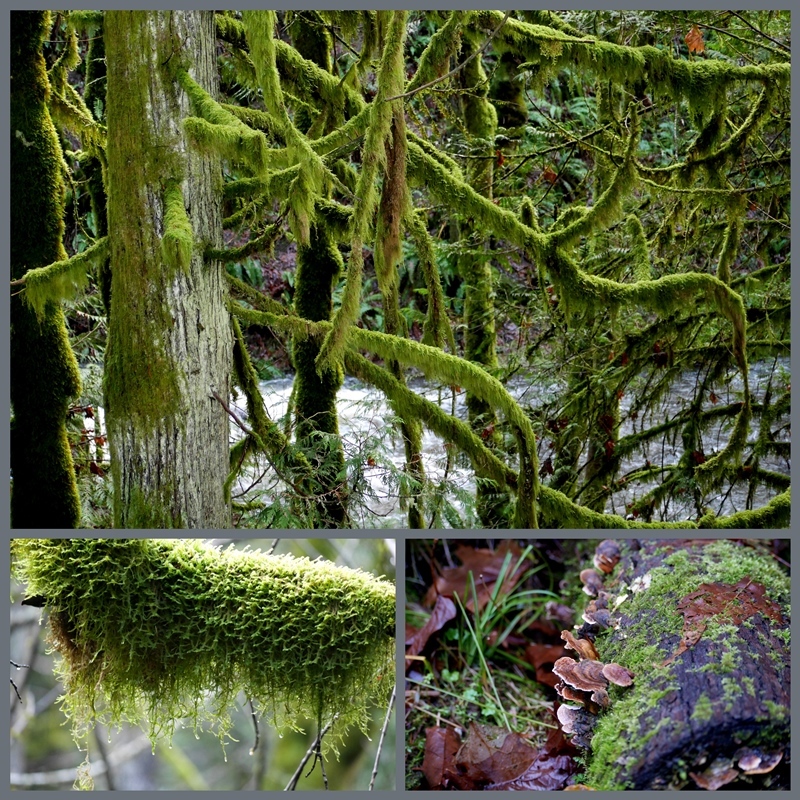 I also loved the photos of moss--a sight we rarely see here as our altitude and lack of rain makes us so dry. I do see the light of day getting longer again....it is so welcome! Your photos are so beautiful and judging by your descriptions, the scenery during your Sunday journey was even more beautiful in person. Happy week to you sent with wishes for a little more sun. So very beautiful! Glad you were able to enjoy the outdoors and magnificent nature! Sounds like it was a lovely day indeed. ...Hope for springtime! Wish you a very good New Year with health and lucky moments. Lovely serene photos - being surrounded by natures beauty and a little sunshine can lift our spirits immediately. Apart from being very poetic, Rumi's words have a soundness to them. I will never forget the time that I visited his tomb in the 13th century sanctuary of the Dervishes in Konya which lies in a rather remote area of central Turkey. Beautiful photos, serene and peaceful. You take some amazing pictures, I feel like I am walking there with you! Oh I love that someone decorates a tree in the forest! We used to see one here but it is gone now. LOVE your nature photos. We are working hikes in depending on the weather too! Love the details in the ducks...such a beautiful photo! Hugs! The matte sky in that last photo up against the bright colored boats...beautiful. Beautiful photos. Thank you for always seeing beauty and sharing it with us Lorrie! These are soul filling! Glad you were able to get out and enjoy that sunshine. You captured the light in your photos beautifully. Such beauty it was a joy to visit. Best wishes for the New Year. Your photographs are lovely to see. I do think the days are beginning to get a little longer, and that is most welcome. Gorgeous!! Walking in the woods is like magic for sure. Oh the sunlight shining through is so special. Then ending with a delicious sounding lunch, yummmm! Lovely photos, Lorrie. Hope your first day back at school went well! Lorrie, the colors in your photographs are so vivid and full of life! I think the green mossy one is my favorite! Thank you for sharing them with us. ...Lorrie, you live is a fairyland, a part of the world I want to visit. Thanks for sharing these gorgeous images. As always, such beautiful pictures! The shot of the light filtered through the moss . . . stunning! Thanks for sharing these glimpses of your walk! Beautiful images you have done. The birds are superb, and the bog is brilliant. Thank you for dropping by. Great series of photographs depicting both the wildlife and the habitat. It is easy to see how the old colloquial name of Baldpate for American Wigeon came about. These days I fit the bill myself! Wonderful photographs. It almost looks like Spring is coming your way. It must have been a perfect day. Who would have thought with the rain and hail before Church, that you would come out to sunshine! Can’t miss those opportunities in winter! 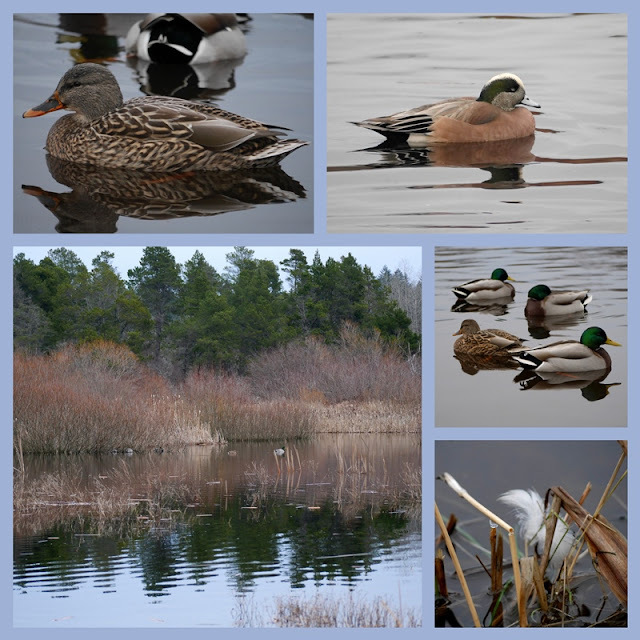 An interesting walk, I love the fern greens and the wildlife on the water. I agree with Angie. I, too, especially like how you caught the light on (with?) the moss. Your walk was enchanting. Thanks for sharing. Dearest Lorrie; First of all, late Happy New Year 2019!!! I learned the word "dawdle "; I always thankful for learning and enjoying to see the scenes from blog friends♪　What magical pictures of nature "frost,moss, mushrooms" and loved the reminded Christmas ornament. The words that came to my mind while reading this post are: soothing (those peaceful views), magical (the play of light and shadow in the forest, and yes, also the Christmas ornaments) and... enviable (reaching easily a lovely Cafe that serves tasty lunches also on Sundays :)). I love your photos and picturing you and Tim on your walks, and enjoying lunch together. Lorrie, your photos are breathtaking (my favorite is the first). And they make me want to go to the places you photograph. You could have a second career at the tourism board! We've had a lot of rain/fog/ice here too...and when the sun decides to come out, we jump and run too! It must be enjoyed and soaked up! You captured the beauty of the bog eloquently, such a beautiful variety of birds to enjoy! And oh my, I just loved the picture of the boats at the dock, perfect lighting and moodiness in that picture! It's a framer! It is incredible to me how fast the landscape changes with the sky's moodiness. Your lunch sounded perfectly delightful :) Blessings and hugs! That decorated tree out in the forest was fun! Smiles for this whole beautiful post!